These cardamom donuts are sure to satisfy your sweet tooth. In this recipe, the cardamom is integrated into both the donut dough and the frosting. Yum! In your KitchenAid mixing bowl, dissolve the yeast in the warm water. Let rest for five minutes. Once the warm water has activated the yeast (which should be indicated by it being bubbly), add the lukewarm buttermilk, sugar, salt, ground cardamom, vanilla extract, and just one cup of cake flour. Mix with the paddle attachment on medium-high speed until combined. Next, add in the second cup of cake flour. Mix until combined and then add the third cup. If the dough is still too sticky to the touch, then add in more cake flour 1/4 cup at a time until the dough no longer sticks to the sides of the mixing bowl. Remove the dough from the KitchenAid bowl and paddle attachment and place on a lightly-floured surface. Knead into a ball, then cover with a cloth napkin and let rise for one hour. When all of the donuts have been cut, drape a cloth napkin over them and let rise for another hour. When the donuts are done rising, you can begin heating up the oil to fry them. Fill your dutch oven up 3 inches deep with vegetable oil and place over medium-high heat. Use a candy thermometer to heat up the oil to about 360 degrees Fahrenheit. When the oil is ready, gently dip each donut one at a time into the oil. For medium-sized dutch ovens, it's best to fry just three donuts at a time. Let donuts fry for 1 minute and 15 seconds on each side. Use frying tongs to flip them over and fry for the same amount of time on the opposite side. Then, remove them from the oil and place on a paper-towel lined plate. Repeat until all donuts are fried. Then, let the donuts cool for about five minutes before frosting them. In a small mixing bowl, melt the butter in the microwave. Then, add in the powdered sugar, half & half, and cardamom. Use a whisk to mix all together into a deliciously gooey frosting. Put your choice of topping (nuts or sprinkles) in a separate small mixing bowl. Right before you frost the donuts, pop the frosting in the microwave for about 10 seconds to get it warm, then use a spoon to mix the frosting. Dip each donut about halfway into the bowl of frosting. As you lift each donut back up, let the excess frosting dip back into the bowl. 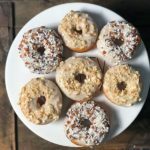 Immediately dip each donut into the bowl containing the toppings. Then, set each donut aside.